Moulton College was handed an 'inadequate' rating in April 2018. A Northamptonshire college that was handed an 'inadequate' rating by the education watchdog last year is struggling to help their students achieve in class, a report says. 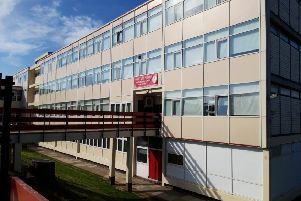 Ofsted found serious breaches in health and safety at Moulton College in April 2018, including a number of 'unsafe and sloppy' slip-ups in management. The school was told to make immediate improvements to bring the college's standards back up to scratch. In a report published on this week (January 9), the school was told they were making 'reasonable progress' in several places to turn things around - but were also failing to help their students achieve better grades or make progress in their learning. However, it also mentioned it was 'too early' to tell if systems put in place since the April inspection were tackling the ongoing problems they found. Ofsted has pointed to how the number of students achieving in English and maths has shrunk in the last academic year [before the results of the report in April] and that 'significant problems remain' this year. The report reads: "The proportion of students achieving their qualifications was low in 2016/17 and decreased in 2017/18. "Students’ motivation for attending [English and maths] is low. The quality of teaching in English and mathematics is significantly poorer than in other subjects. Teachers do not encourage students to practice and improve their skills through frequent homework. "It is too soon to determine whether students beginning their studies in 2018 are making suitable progress in these subjects, but early indications are that significant problems remain." However, the report noted 'reasonable progress' in improving the quality of teaching and addressing the safety issues found in the last inspection. In particular, a strengthened student behaviour policy has cracked down on bullying and has led to the expulsion of five students for anti-social behaviour. The school was reinspected in November as part of a series of spot-check monitoring visits following the 'inadequate' rating. The visit does not affect their overall rating. Moulton College has been approached for a comment.